A smart contract token economy that unlocks social selling for the $24 Trillion retail market. The Astra Platform is a technological infrastructure for retailers and brands to integrate with and build a social selling channel. Our solution democratizes the model to promote equity between sellers, retailers, and brands. 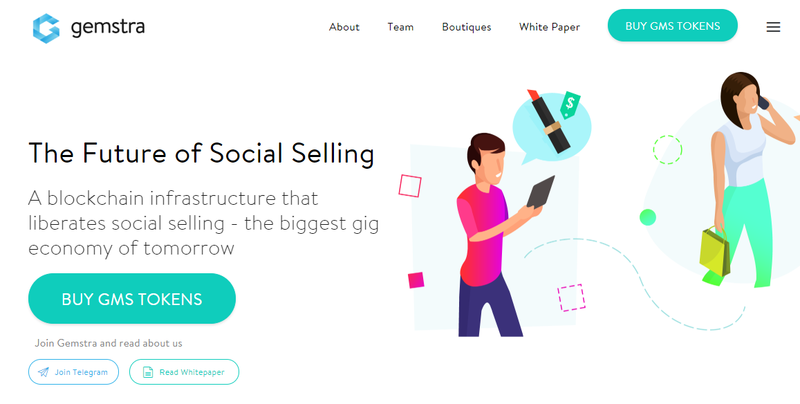 Astra liberates social selling by leveraging blockchain to store data, process transactions, and decentralize control. Any retailer and brand can now integrate with ASTRA to participate in social selling and benefit from an easy-to-use protocol. Gemstra Token (GMS) are used for payment, commission, rewards and governance of the Astra Platform. Sellers are held captive in an industry stifled by giants. Barriers to entry are high, limiting new merchants from entering the space and allowing incumbent monoliths to continue cornering the growing industry. This creates an underserved and overpriced industry with few opportunities. Companies keep sellers captive prohibiting selling other companies and making it difficult to transfer customer, transaction, and genealogy (network) data. Sellers face immediate income risk should they seek mobility. BOUTIQUES - the world’s first social selling marketplace. Launched in July 2017, our marketplace has attracted thousands of people to a new paradigm of social selling by providing a platform for retail brands to integrate their catalog of products. Sellers are free to sell only the products and brands they want through a customizable storefront. We amassed 3000 sellers, 8 brands, and reached 7-figure runrates within 10 months of launch. This organic success proved that retail brands want to participate in social selling while sellers desire freedom. Leveraging smart contracts with blockchain technology to put data back in the hands of sellers and enable merchants and brands from the $24 trillion global retail economy to join social selling. ASTRA is exactly what the stakeholders of social selling need - the de facto infrastructure for an unpredictably huge future market. In 10 years, Gemstra eyes an industry valued well over $1 trillion globally and seeks to serve 50% of industry volume as its default commonwealth infrastructure. Sellers own their data and control who can access it. They choose who they want to work with. Have a ready-to-use protocol for social selling that can be integrated through Gemstra’s open source software or SDK. Can integrate their catalog of products with any Merchant in the ecosystem and activate multiple networks of Sellers. By reducing friction, participants in the Gemstra economy get bonuses when electing to take payment in GMS. The social selling model depends on gamification for retention. Companies use reward models to promote sellers to achieve above and beyond default commission plans. Consolidate and reduce costs for industry depending on fragmented systems. Sellers get paid instantly and earn spot bonuses when withdrawing tokens versus fiat. Brands and Merchants can reward Sellers for custom achievement and engagement-based actions above default commission. A truly democratic ecosystem where actors dictate the direction of business based on what they’ve staked. One GMS = One Vote. Social selling is the art of using social networks to locate and interact directly with prospects. Perhaps the earliest form of social selling was in the early 1900’s, when Brands empowered independent representatives (“Sellers”) to sell their wares door to door, with a focus on one-to-one demonstrations. The model has evolved over time and exponentiated in recent years with the adoption of the Internet. Today’s social seller can market limitlessly through online avenues, especially with the rise of social media. Why Does Gemstra Need Blockchain? Previously, Sellers’ data was owned and locked by captive companies that dominated the social selling landscape. Gemstra’s vision was to decentralize the space and deleverage the risk to Sellers in the traditional model. The decentralized architecture of blockchain allows us to democratize data on a public ledger that promotes equity and fairness in the social selling model. What Purpose Do GMS Tokens Serve in Gemstra’s Ecosystem? Aside from reducing friction for an industry depending on multiple fragmented systems, the Gemstra Token gives the ecosystem a framework for Rewards and Governance. Gamification has been a cornerstone of the social selling industry for decades. Companies gamify achievements or actions so Sellers stay engaged. Merchants and Brands can customize a Reward System that is built into ASTRA. A system of staking and voting democratizes the economy by giving stakeholders rights in deciding direction of the business. Previously, industry giants made arbitrary decisions in a model where Sellers were leveraged. The Gemstra Token can be staked at the Merchant level so Sellers and Brands have a say in direction-making. What is Gemstra’s Revenue Model? The BOUTIQUES Marketplace connects Sellers and Brands. BOUTIQUES is a Merchant in the ASTRA Platform. Gemstra Foundation operates BOUTIQUES and earns approximately 15% of sales volume transacted in the marketplace. The ASTRA Platform is a smart contract platform that serves as infrastructure for social selling transactions. Gemstra earns 1-2% in tolls and monthly fees from Merchants and Brands using ASTRA. How is Gemstra Different From the Rest? 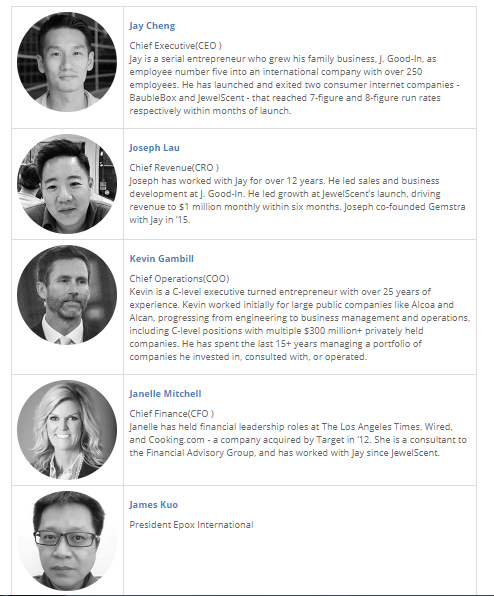 Gemstra is utilizing blockchain and cryptocurrency to solve a systemic problems in the $180Bn social selling industry. This is a fast growing industry shackled by centralization and captivity. The solution to industry problems is aligned with the thesis of cryptocurrency. Unlike many projects, Gemstra has a proven business model (Gemstra BOUTIQUES) where Sellers and Brands are partnering to generate sales. Within 10 months of launch, BOUTIQUES was on track to over $5Million in annualized revenue. We are eager to see cryptocurrency and blockchain solve real problems in today’s global economy. We want crypto to help families across the world through the social selling model. As merchants that happen to be technologists, we are excited to see crypto really succeed in changing lives by disrupting traditional value chains. We have a proven business (Gemstra BOUTIQUES) and a proven technical roadmap to solve those problems. The first step to utility for Gemstra are Checkouts and Commissions transacted, calculated, and paid for with Gemstra Token (GMS). Public utility is planned for October 1, 2018. Though the code for Checkout and Commissions will be done by September, we need adequate time for testing as live payments (discounted with GMS vs fiat) and commission withdrawals (bonused with GMS vs fiat) will be implemented into BOUTIQUES first.